Шведский дом - строительство каркасных домов коттеджей под ключ.Таунхаусы эконом класса! Birthplace of our project is the Swedish ski resort Are. There we met with builders, engineers, designers, and chose this project a frame house, carrying elements are ribs and stringers. For supervision over the construction of the first houses in the Moscow region (Mytishchi), we invited Benny Pedersen - Head of the Swedish team builders. That was in March 2008. To date, we have already built their own seven of these wooden houses. Two houses in 2008, three in 2009 for our own needs, and two Swedish house in 2010 for our customers. Photos published in the section "Photos of completed houses". We are proud of our work, as construction, technology, designs, finish, production - it's all about where we invest a part of our soul. Full list of our competence in the field of construction. •	Fundamet Swedish home - monolithic reinforced concrete buried. This foundation is 7-8 times more expensive than shallow-buried foam blocks or a new use screw piles. But these "screw-topped" foundations practically have no operating history in Russia. And our proposed reinforced concrete monolith - it's proven solution, which applies not only to the frame, but even for brick homes. • Swedish House consists of only natural materials. Exterior walls - planed board width 145 mm and 22 mm thick, painted with oil paint Tikkurila (pro Islands Finland) in two layers. It's beautiful, natural and durable. Wall is austere, warm, smooth, shiny and clean. It's nice to touch, it's attractively to have а long look, it's very good to sit close to it on the veranda. This is not an imitation of the foam and plastic, it is a real and healthy. This does not make your house in politetilenovuyu box. This wall looks premium and at the same time is situated in harmony with the environment. Of course, price per square meter of such finishing is 3-4 times more expensive than the finish siding and 2 times more expensive finishes artificial stone. By the way, in Sweden there is no frame houses with walls made of plastic siding, or a sandwich from the front putty, or of artificial stone on top of GSP. • Structure of houses - timber frames (200mm x 50mm). Insulation - unshrinkable basalt slab Rockwoll, which total thickness is 150mm. This is 50% more than 100mm insulation, which is now considered a standard. • Roof - soft tile IcoPal (Finland) - one of the most expensive on the market. Soft shingles safer is more beautiful and bonuses than the sheet metal. It is more expensive, its installation takes more time. • Material of internal walls - plasterboard on structure of metal profiles. Such a project implies that after the interior finish from inside the house will look like a business class flat. So it is. Details - in the section Finishing. 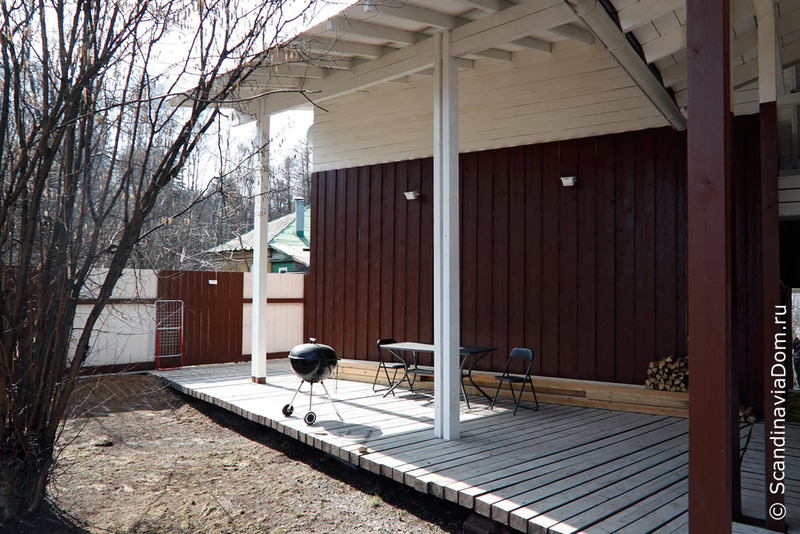 • The entire house perimeter is surrounded by veranda. The veranda can be accessed not only through the front door in the hallway, but also directly from any room in first floor, including the living room and kitchen. 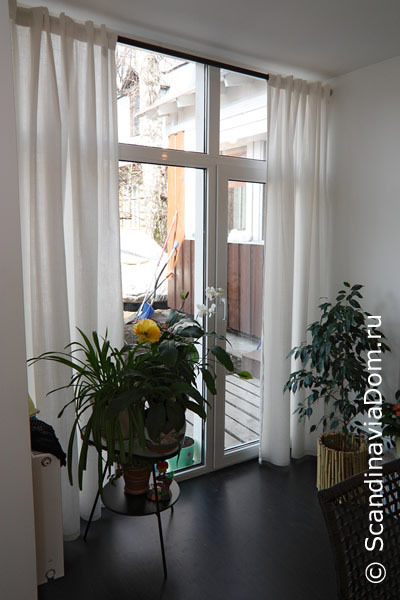 This greatly expands the space, and when the weather allows, a veranda is an extension of a room or living room. In the summer especially pleased to make a meal on the street, or just sit outside. Floor of veranda - rail sliced 50 mm thick, covered with a white antiseptic Tikkurila, specially designed for the open street floor. Beams laid on solid concrete strip foundation with a clearance, allowing wash the floor porch with a hose or pressure washers. Square of veranda is big, but we do not consider it for calculation area of the house. Please pay your attention when you compare the cost of construction of Swedish houses per square meter with other offers on the market. •	We use the expensive construction and finishing materials. It is stipulated in the project and is a guarantee that you will not have to do an internal or external redecoration every 3-4 years. And, most importantly, we do not do it at your expense. 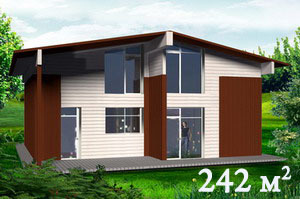 To ensure that you can compare price of construction Swedish House with any other offer on the market. •	Whole kitchen equipment - countertop, cupboards, shelves, drawers, built-in hob, oven, double sink, mixer - included in the cost of finishing. Please pay your attention this when you compare the price of finishing the Swedish House with other offers on the market. •	Location of kitchen countertops in the studio: you are preparing food or washing dishes is not facing the wall, but face-to-room, in front of you a huge box from floor to ceiling, and a dining table at which sit your family or guests. 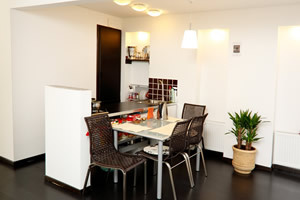 Behind your back, built-in cupboards streching along the wall and built-in refrigerator. During the process of cooking food you can chat with those sitting around the dinner table or on the couch in the living room to watch televzor, watch the play on the carpet your children. •	Wall-mounted heating boiler, washing machine and oven are located behind a transparent sealed door made of glass, in an alcove kitchen wall. In the same room brought a wide air intake from outside and the chimney. 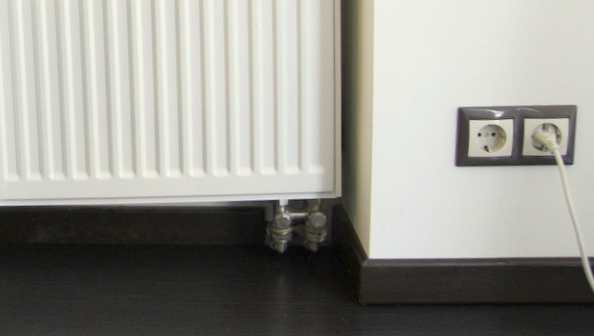 Thus, you do not need to keep the winter window in the room constantly opened, as required by the rules of operation of gas plants, because in this case the pot and the oven takes oxygen is not out of the room, but directly from the street. Besides, you do not interfere with the working noise of the boiler and washing machine. The boiler is included in the cost of construction, the oven - at the cost of finishing. •	Spacious bathroom unit placed on the first floor has two sinks, embedded in a wide countertop, bathroom with Jacuzzi and hanging down the toilet. Warm water heating floor placed in the bathrooms do not waste energy, and hanging toilet facilitates cleaning, flushing tank hidden in the wall and the entire floor is viewed as a clear box, no cubbyhole, where it can hide dirt. The bathroom also has a window with frosted glass, the MDM can be opened, when too much steam and exhaust does not have time. And when he sun shines through the bathroom's window, washing in the morning gives greater vivacity. 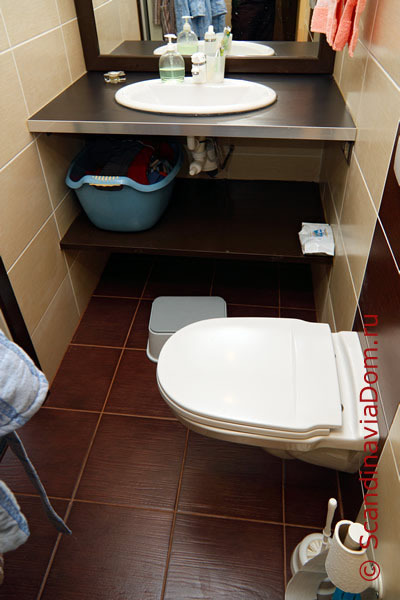 •	Second-floor bathroom - sink with countertop, toilet and shower. But this is not a plastic shower, and a classic shower walls and floor tile. Shower is separated from the bathroom door made ? 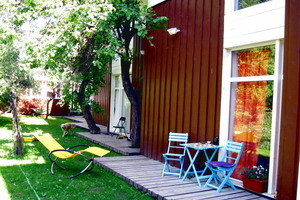 ?of tempered colored glass, such as those that ustanavliayutsya saunas. 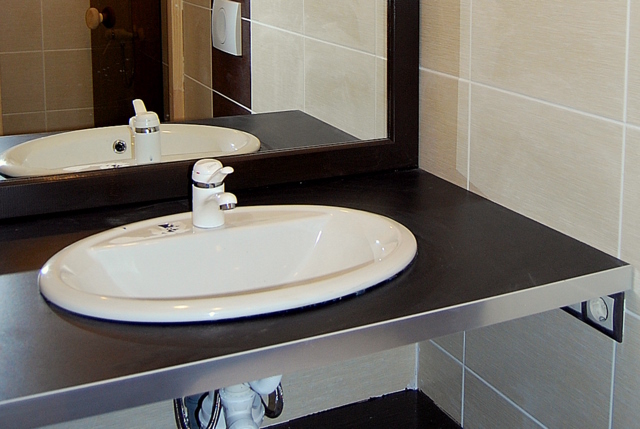 •	Sinks, countertops, shelves, faucets, mirrors, hanging toilets, whirlpools, showers included in the cost of finishing. Please pay your attention this, when you compare the price of finishing the Swedish House with other offers on the market. •	Interior lighting is one of the strengths of the Swedish designers. The basic idea is that the very source of light was unobtrusive, and beauty should be made by the light itself, paying attention to some details of interior. Therefore, as the lighting in our house used by the Swedish point energy saving lamps, mounted in the ceiling, as well as tubes of warm light, located in special compartments on the ceiling or walls. It is included in the cost of finishing. •	Built-in wardrobes - the standard for Swedish homes, so their manufacture of plasterboard and profiles included in the cost of construction. 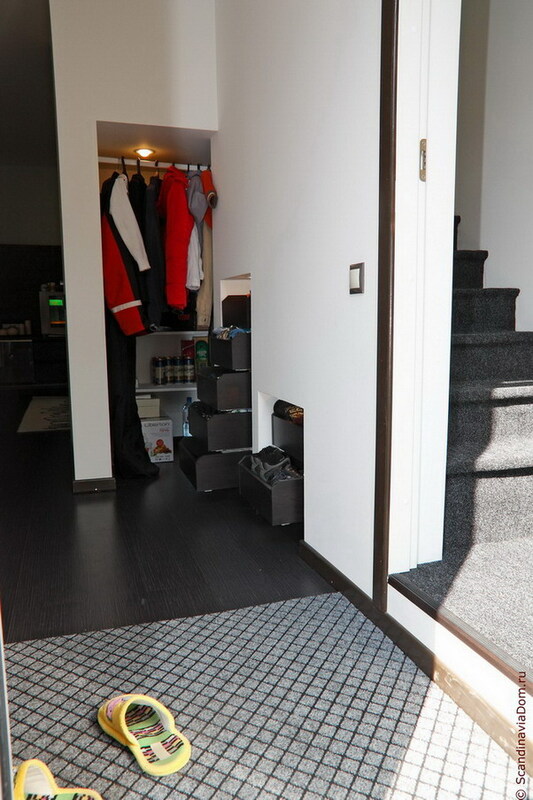 These lockers are provided in each room, kitchen, living room and hallway. They are very roomy, but the visual does not take away space. it is evident from layout . In other words, you do not have to buy and collect huge wardrobes that are very rarely successfully enter into the interior. You get a much more modern, functional, comfortable and successful element of interior design than just a closet. Whole doors, shelves, clothes rails, drawers and finishing these cabinets included in the cost of finishing. Please pay this your attention when you compare the price of finishing the Swedish House with other offers on the market. •	The ceiling of the second floor repeats the pitch (15 "). So attic is completely absent in the house, giving a useful volume of the room the second floor. Thus, the average height of the ceiling and windows of the second floor is higher than the standard 2.5 meters on the ground floor. Also this solution allowed to make a high, comfortable yet unobtrusive mezzanine above the second floor bathroom. 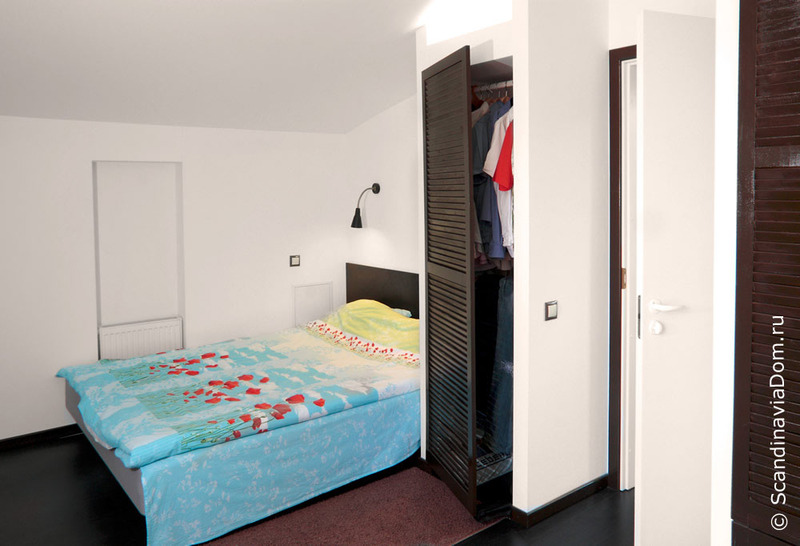 •	All rooms - isolated, regular square shape and an optimum area. 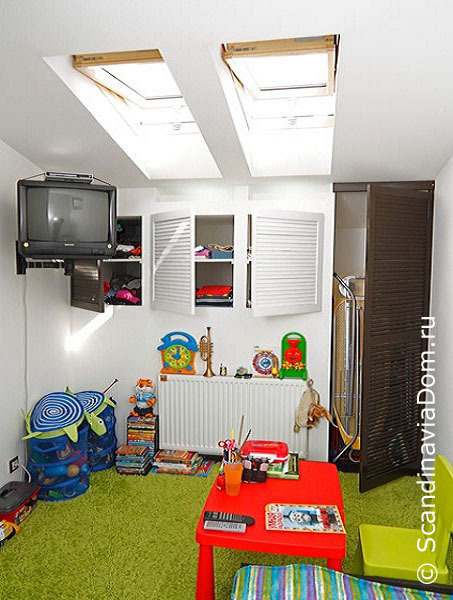 It was possible to do without long corridors, halls and near the staircase hall and under stairwells sites, which in ordinary homes eat up tens of meters of useful floor space. This - the standard of Swedish design. The more rational use area, the more valuable project. Plus, the configuration of the rooms themselves (the dimensions of walls, width of the niches, the location of heating appliances, windows and doors) can accommodate beds, sofas, chairs and other furniture, the most convenient, efficient and comfortable. 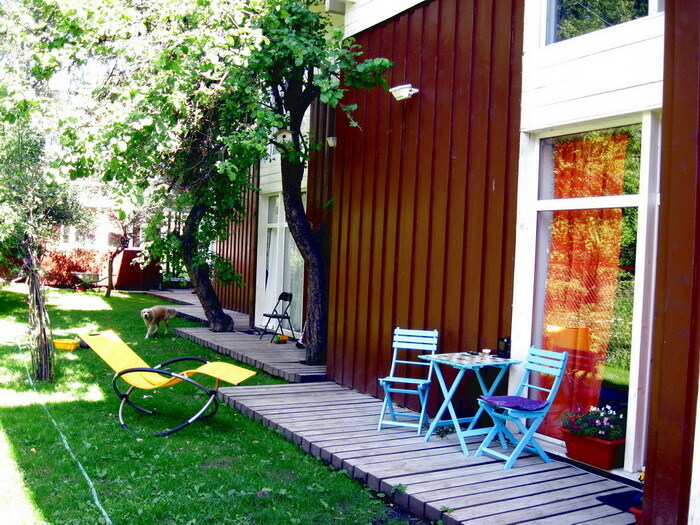 Just like in the plan, which were designed by Swedish designers while working on a project of this house. Two winters, the latter of whom excelled abnormally long and strong frosts, once again confirmed the validity of the project, the choice of construction technology of the frame house, and our expertise in construction. The houses that we built for this project, always warm, all the engineering systems and communications work reliably, there are no any cracks in the tile or a wall-paper. We are ready to continue to build homes responsibly on this project for those who liked it. 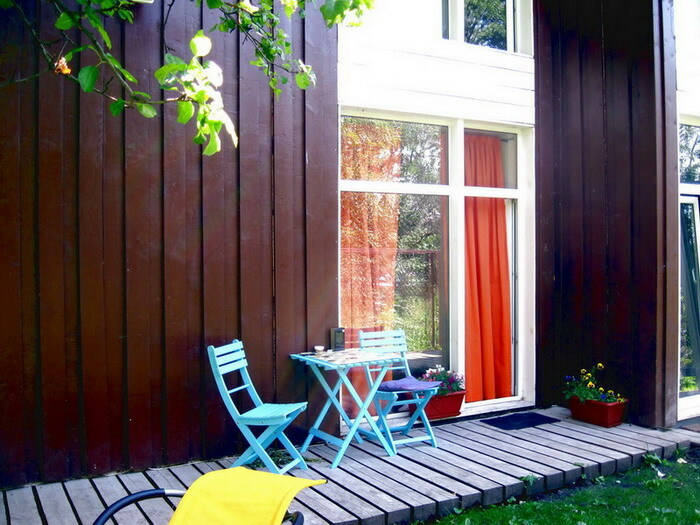 We are also ready to share decisions for your own business on the basis of Swedish houses. The construction of frame houses on the key is very spreaded in Russia - it's timber frame houses using Canadian technology, modular, prefab houses, villa economy class. From the outside it looks like a house, but actually you cannot live in it, because the declared cost of the finished frame house is not nothing but a foundation, walls, roofs and windows (the so-called frame-house production). And in the future in people takes much more time, effort and money to make the house easy living: electrician, wiring and water sanitation, heating, plumbing, kitchen, living fine finish ... And on to finish the whole interior, as the illustrations in magazines or on Web sites about the beautiful houses, very few people can turn out well, and the price of the final solution increases many times. And it is not even about money, but the fact is that the original layout of buildings for the construction of turnkey done on the basis of convenience, the builder, not the customer. Construction companies developt an optimal plan, aiming at a minimum cost per square meter, which allows them to sell the house for a large profit. The total area of the timber frame house at first glance is a worthy, but will subsequently uncomfortable arrangement. The area will be lost due to inability to rationally arrange the furniture, bathroom set, select suitable sites for radiators, electrical appliances, switches, points of drainage and inlet, it is convenient to design the kitchen. As for our project , at first engineers did not work on it but designers. They worked not from a box, but from human. The first turn situation've been drawn, the most convenient for the family, with all details, right down to the size of furniture IKEA, that is important for Swedish as it is for Russia. It is the designers shaped the original configuration of rooms and space at home, and engineers from these data is expected to design. CAP area to be very high, and therefore in Sweden we jokingly said that 80 square feet of this house is 100 square meters of conventional wooden houses. 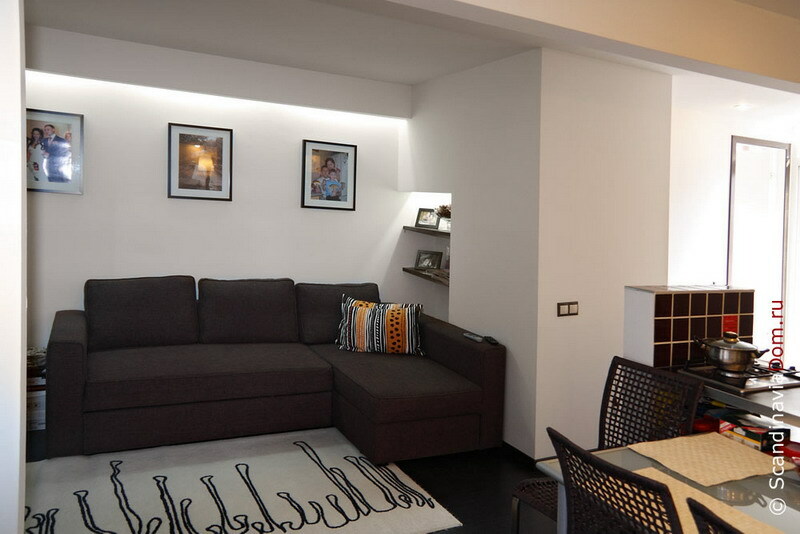 By purchasing a house or flat, people hire designers to create interior decoration, layout, furniture arrangement. Swedish House turnkey 'already includes work on the design, done very professionally. In our point ofview, finishing is a complete preparation of a wooden house to stay, including the design and creation of the interior.In fact, it should be. 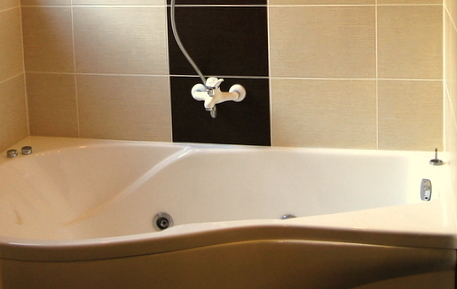 The cost of our finishes include layout of water and sanitation, electricity, heating, ventilation, walk-in closets with shelves and doors, install plumbing, kitchen equipment, mirrors, interior lighting, tiling, laminate flooring, wallpaper with paint, doors, and various interior stuff that require attachment to the walls. To see everything that goes into finishing not only internal but also external, you can in the photographs of houses on a turnkey basis or through personal visit to one of them. This is just 1 km from Moscow to Yaroslavl Highway. 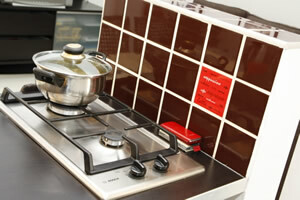 To acquire a familiarity in detail with the specification and price you can in the section «Technology and Materials». 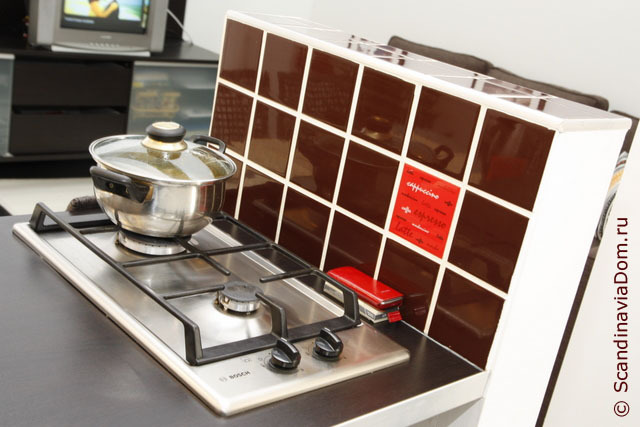 The price includes finishing the same way all the finishing materials, engineering equipment, water heating systems (boiler, radiators, pumps, pipes, fittings, manifolds, chimney), plumbing (faucets, toilets, sinks with counter tops, whirlpools), wiring products (machines , Sockets, switches, lights), doors, kitchen countertop with sink, hob, kitchen drawers and shelves, interior elements (mirrors, towel holders, shelves, cabinet doors). All models, colors and sizes are exactly as provided for design projects. Price of the finishing are not directly specified, but it can be easily calculated: the price of ready-to-stay at home minus the price of a home under the key. Our prices are accurate, we do not make you wait for us to estimate, everything is ready, and no surprises will not - because we have already built these houses and will also build on. In our opinion, we are more than competitive not only in price but also in quality, since we have only four brigades of builders who have been built together for seven wooden houses on this project. All the processes of construction have been established, the technology of building a frame house developed, errors and rework happens, the performance of construction is very high, we use the expensive construction and finishing materials. We do not have time for more than two sites, a permanent member of the group, supervise them ourselves. Therefore, we do not build more than three houses per year. We do not seek to maximize earnings, we really love our job and our frame houses, and for us it is important who is our customers. We strive to work in comfort for themselves and for those to whom we build houses.